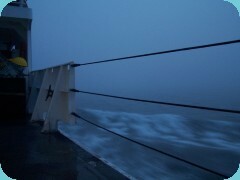 From July 23 through August 1, 2005, the Immersion Presents team will post updates live from the R/V Ron Brown. Bookmark this website, and remember to join us for our next adventure. The ROVs came back to the surface this morning after their first dive at Lost City. The science team was very excited to retrieve the samples that Hercules had collected. Today the team is busy getting ready for the next dive. Meanwhile we are continuing our broadcasts back to Immersion Presents sites across the U.S. This is the first time that the chief scientist of an oceanographic expedition is leading the mission from shore, using technology to see what the team on the ship is seeing. Dr. Deborah Kelley is at the Science Control Center at the University of Washington (UW). From there, she and her team can see all of the video coming from the remotely operated vehicle (ROV) cameras. They can tell the team on the ship where to drive the ROVs and which rock samples to collect. 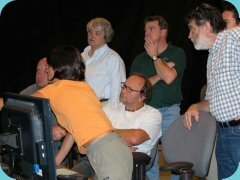 The two teams are constantly communicating using our satellite and Internet 2 link. The ROVs are back in the water this afternoon after a quick recovery to retrieve samples this morning. As we get ready for the next broadcast, we are seeing amazing live video of the underwater structures at Lost City. Some photos from earlier dives are now available online. We'll share more underwater images in the next few days. Has anyone seen the elevator? 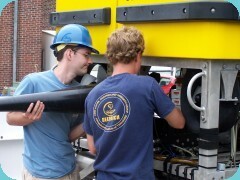 The remotely operated vehicle (ROV) Hercules can carry boxes to hold the samples it collects. But sometimes it's not convenient to bring a sample up with the ROV. That's where the elevators come in. An elevator is a special platform designed to carry samples up from the seafloor so they can be retrieved by the team on the ship. 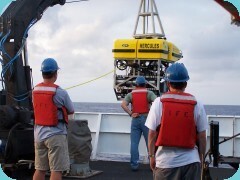 The elevators can be used to bring up samples while the ROVs keep working underwater. Read more about Has anyone seen the elevator?